The theme of National Hospice Month 2016 is Know Your Options. According to the Conversation Project, 80% of people say, if they had a serious illness, they would want to talk to their doctor about end-of-life care options. Only 7% actually have that conversation with their doctor. In honor of National Hospice Month 2016: Know Your Options, we are sharing resources that will help you identify your wishes, formalize them using Advanced Care Planning documents, and then share them with your family and healthcare providers. NOTICE: The information shared here is not intended to serve as medical or legal advice, but only as a resource as you begin the process of making medical and legal decisions related to your health and healthcare. 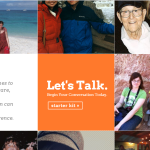 Follow the link in this photo to visit the starter kit at The Conversation Project. We highly recommend the Conversation Project as an excellent way to help you answer the questions about what matters most to you when you think about the end of life. The online starter kit is a great place to begin (scroll down a bit to find the arrows that take you through the kit). The website is rich with other resources as well, including tips on talking with your family about your wishes, talking with your doctor, and links to other resources. TIP: Thanksgiving and Christmas bring everyone together from near and far and are excellent times to talk with family members about your wishes. We also recommend the Moment’s of Life interactive tool, called Know Your Options. It was created by the National Hospice and Palliative Care Organization, and shares ideas and resources based on the way your answer the tool’s questions. Consumer Reports has done a tremendous job of gathering information about care and treatment options that seniors, in particular, and their caregivers, should know. 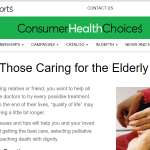 Their “Advice for Caregivers: Treatments and Tests for Seniors” is helpful. “In Depth: Advice for Those Caring for the Eldery” is full of resources and good reading on talking with doctors, end-of-life care options and concerns, caregiver support, and helpful information on common challenges such as anxiety, sleep patterns, medication issues, and more. Confused about DNR, EMS, Health Care Surrogate, and More? The link in the photo will take you to Conversations of a Lifetime and all of their excellent resources. The words and abbreviations involved in reading and talking about care and treatment options, and advanced care planning, can be very confusing. This resource from Conversations of a Lifetime is a great start, because it simply helps define each word and abbreviation. Once you have a handle on the definitions, explore the rest of their site. 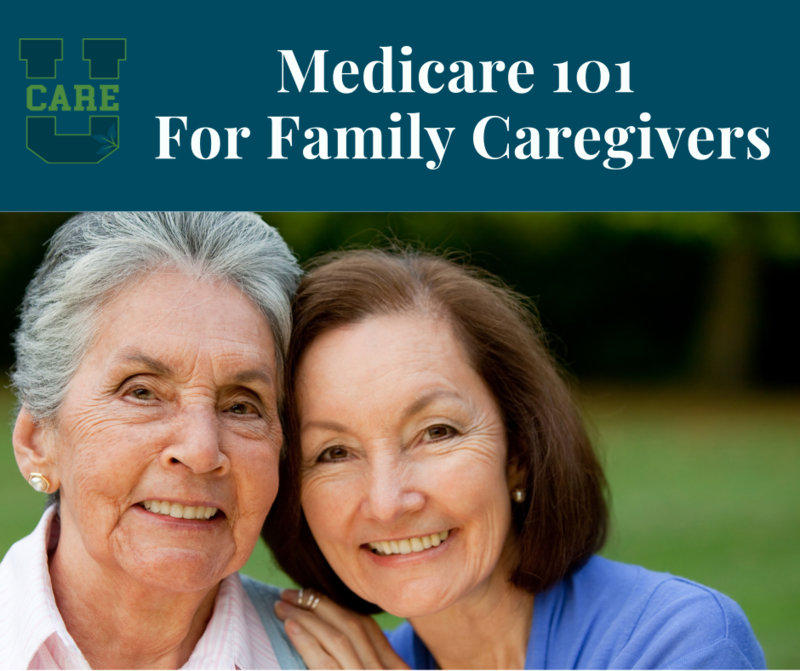 They, too, have excellent resources and information on how to know what you want, how to talk to your doctors and family, advanced care planning, and more. The Conversation Project: As mentioned earlier, this is an excellent resource. Once you get to Step Three in the Starter Kit, you’ll find several creative ideas for how to start and continue this conversation with your family. 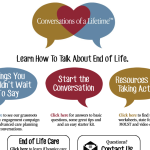 Caring Info Conversations Booklet: Caring Info is a wonderful website for caregivers and individuals with a serious illness, with many useful resources, once of which is the Conversations Booklet. Loaded with tips on how to find the right trigger for the conversation, how to communicate across generations, and more, it’s a wealth of information. Then, go explore the rest of the Caring Info website, including this section on how to talk to your healthcare providers about your wishes. Conversations of a Lifetime: Also mentioned earlier, you’ll find so many useful tips and loads of advice at the Conversations of a Lifetime website. In addition to informing your family and healthcare providers of your wishes, you also need to formalize your preferences in the Advanced Care Planning documents available to you in your state. Together, these two steps will go a long way toward ensuring that your wishes are honored and respected. 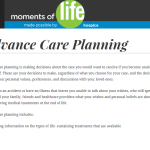 Click on the photo to visit the Moments of Life resource on Advanced Care Planning, with links to the legal documents available in Kentucky and other states. Kentucky Advanced Care Planning Documents: The Kentucky Living Will is a comprehensive document that allows you to identify a Healthcare Surrogate and your preferences on life-prolonging interventions, artificial nutrition and hydration, and organ and tissue donation. There is also space to outline other healthcare instructions. M.O.S.T.–Medical Orders for Scope of Treatment: Now available in Kentucky, the MOST form is a new way to document your wishes. Unlike the Kentucky Living Will, it does require a physician’s signature, which is a good way to ensure you speak with your physician about your preferences. In fact, in order to complete the document, you’ll need your physician’s guidance. Other States’ Advanced Care Planning Documents: If you are outside of Kentucky, this helpful directory will link you to the correct document(s) for your state of residence.